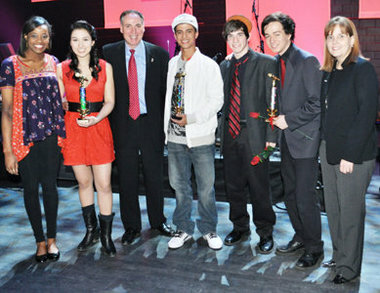 SONGSTERS — Third-place winners at the New Jersey Shout Down Drugs Statewide Prevention Concert held in Newark on May 5 are (from left) Taylor Willis and Morgan Evans, who is from North Hunterdon High School; first-place winner Aryan Mahyar; and second-place winners Tyler Spiegeland and Johnny Costa — both members of the group MIDDLETWO. With them are Angelo M. Valente, executive director of the Partnership for a Drug-Free New Jersey, and Kimberly Smith, Comcast’s Director of Government Affairs. All the winners were awarded music contracts to represent the partnership organization at drug-prevention events throughout the state over the next year. CLINTON TWP. — North Hunterdon High School sophomore Morgan Evans teamed with a student from Morris County to win third place in a recent statewide music competition that promotes drug prevention. Evans and Whippany Park High School junior Taylor Willis performed their original song titled “Join Me” at the New Jersey Shout Down Drugs Statewide Prevention Concert held May 5 at the New Jersey Performing Arts Center in Newark. for a Drug-Free New Jersey at prevention events throughout the state over the next year. The 43 performers were finalists in the competition that invited high school students from around the state to create music and lyrics with substance abuse prevention messages. The high school students from 24 schools around the state, in 18 counties came together at the arts center to perform their original music before a panel of judges. Along with Evans and Willis, other finalists included Johnny Costa and Tyler Spiegeland, both seniors at Allentown High School, who took home second place honors, and Aryan Mahyar, a freshman from West Mendham High School who was named the first place winner.